The OneOffice paradigm is all about creating the digital customer experience and an intelligent, single office to enable and support it. In a few months, we won’t be talking nearly as much about automation and digital technology as the critical “value levers” for operations, as they become an embedded part of the fabric of the future operations platform for new generation enterprises. Instead, we will be talking a lot more about OneOffice, where an integrated support operation has the digital prowess to enable its enterprise to meet customer demand - as and when that demand happens. OneOffice is when the needs and experiences of the customer are front and center to the entire business operations, where the old barriers between corporate operations functions (often referred to as “front” and “back office”) are eroded and the constraints of legacy ERP systems are minimized to allow the business to invest in digital technologies and capabilities that enable it to cater proactively for its customer needs at the forefront of its markets and be a very fast responder if these needs change unexpectedly. In short, OneOffice is the endgame, where the digital enterprise can work in real time to cater for its clients. It’s where the intelligence, the processes and the infrastructure can come together as one integrated unit, with one set of unified business outcomes tied to delighting customers. Why is digital the new language of business? In a nutshell, people simply want to operate digitally these days, whether they are an employee, customer or partner. They want to use interactive technology, mobile apps, social media, text, online chat etc. to get things done. People are used to using sophisticated digital technologies in their personal lives, and now expect to use them in their professional lives. Whether they are buying products, groceries, renting accommodation, ordering Starbucks, takeout, applying for mortgages, insurances policies etc., digital technology is the new language of business. The issue facing many traditional business today is the fact that while the consumer is increasingly digitally sophisticated, many enterprises are still beholden to legacy technologies and processes that are fast sinking into obsolescence. In addition, many have employees in the “back office” who are so steeped in the legacy way of doing things, they are facing a double-edged issue: how do they drag their operations kicking and screaming out of the dark ages to support their digital customers? The answer, believe it or not, is quite simple: break down the barriers between departments, involve the digital customer experiences into all the business processes and practices, by creating a OneOfficeTM digital culture where an enterprise’s customers, partners and employees are all entwined together to deliver the end customers the ultimate experience, and the operations function a genuine connection with the true running of the business from back to front. In almost every industry today, emerging disruptive competitors are using digital platforms and cognitive computing that can wipe out “traditional” enterprises overnight. For example, you could be a traditional insurance firm with over 10,000 employees processing claims onshore using green screen computers, or a bank which still has hundreds of main street branches employing traditional retail bank workers, or a retail outlet with no mobile application strategy: your enterprise could be at dire risk of competition attacking your business with mobile app-driven, user friendly, intuitive and cognitive business models, supported by intelligent, affordable BPO and IT operations. Today, we are seeing infrastructure-light insurance firms quickly leap onto their markets, “digital banks” purely targeting Millennials with app-friendly interfaces, and “digital mortgages” targeting consumers by bypassing traditional banks altogether. These are potentially massive business disruptions that can terminate traditional businesses today, not even taking into account the potential impact of Block Chain in the future, if it fulfills even half of its promise to disrupt how we perform secure finance transactions. Enterprises seeking to get ahead of digital disruption urgently need operations infrastructure that enables them to pivot fast and combat these potential fatal threats to their business model. They need to recognize where the threats could come from and quickly hatch a plan to remain competitive by forging a much more fluid operational support model where the customer is front and center to the entire operations of the enterprise (see the graphic above). Digital, in its purest form, is all about transforming the business to create, support and sustain the immersive digital customer experience. These “immersive” customer experiences are about leveraging the omnichannel (mobile, social, interactive technologies) and creating meaningful analytics to create a true digital experience for the enterprise and its customers, its employees and its partners up and down the supply chain. The OneOffice enterprise needs a support function to service those customers, get its products/services to market when they want them, manage the financial metrics, understand their needs and future demands and make sure it has the talent which truly understands how to meet the desired outcomes of their work. Digitally-driven enterprises must create a Digital Underbelly to support the front office by automating manual processes, digitizing manual documents and leveraging smart devices and IoT where they are present in the value chain. Enterprises simply cannot be effectively with a digital strategy without automating processes intelligently - forget all the hype around robotics and jobs going away, this is about making processes run digitally so smart enterprises can grow their digital businesses and create new work and opportunities. This is akin to a “central nervous system” that incepts and processes all the elements necessary to make the enterprise function. Enterprises need their support functions (like an “enterprise circular system”), such as IT, finance, HR and supply chain, to be aligned with supporting the customer experience, as opposed to operating in some sort of vacuum, hence, we are terming this "Intelligent Digital Support", where broader roles can be created. Most of today’s college graduates are simply not motivated to perform mundane routine work: operations staff proactively need to support the fast-shifting needs of the front office, which is changing the hiring needs or savvy digital businesses, many of which are seeing talent which can “learn on the job” as opposed to simply having years of related work experience, which may no longer be relevant in these fast changing markets. Hence, the focus needs to shift towards creating a work culture where individuals are encouraged to spend more time interpreting data, understanding the needs of the front end of the business and ensuring the support functions keep pace with the front office. This is especially the case in industries that are more dependent than ever on real time data, using multiple channels to reach their customers and being able to think out-of-the-box with disruptive business models. Of course, we all need to make sure we can keep the operations functioning by paying the bills, responding to customers, processing the claims etc., but if we cannot be proactive and look at how we can create a better customer experience using digital channels, or challenging the logic of running a process a certain way, we will never create work cultures that will attract the bright minds to take us forward. People want to feel a part of something and that their work matters – and the best way to do this is to move away from rigid corporate structures of the past, with too many management layers and departments run siloed like mini-empires. We need to invest in driven managers, which understand how to motivate and collaborate across business functions. Sales, marketing, customer service, IT, finance, HR and supply chain are functions that all depend on each other to be effective. Smart enterprises are already breaking down the silos and creating multidisciplinary teams, using collaborative tools and Design Thinking methods across delivery centers to help their staff be more motivated, creative and challenge the old way of doing things. 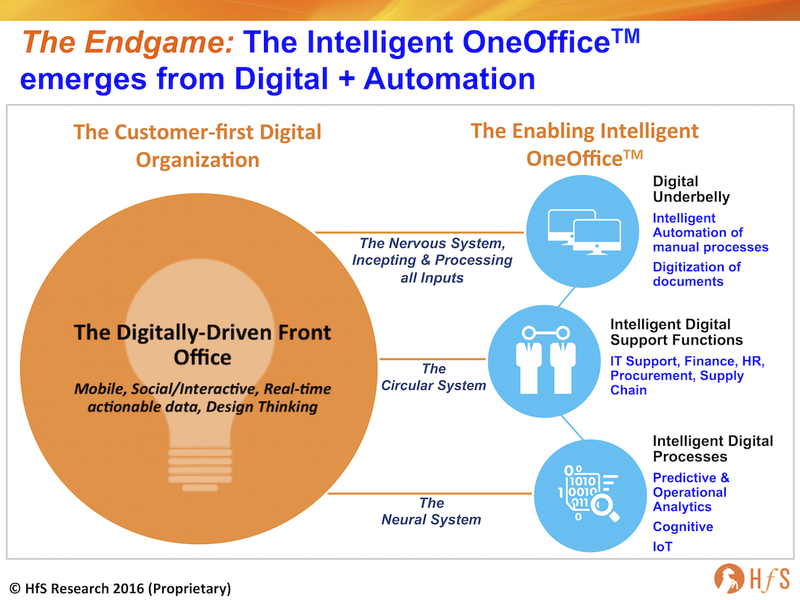 Last, but certainly not least, the OneOffice enterprise is laser-focused on designing business processes that align with its desired digital customer experiences to be competitive and effective in its market. OneOffice is not about collecting and archiving historical data simply to discover what went wrong, it's about being able to predict when things will go wrong and devising smart strategies to get ahead of them. OneOffice is about embedding smart cognitive applications into process chains and workflows, it’s about learning from mistakes and new experiences along the way. This is the “enterprise neural system”. The beauty of the OneOffice enterprise is that the legacy systems and ERP are no longer holding back the enterprise from business progress. Cognitive technologies, advances analytics and robotic process automation can create the functionalities necessary to operate in digital environments by automating and extracting the data needed real-time to respond to markets, support critical decisions and stay ahead of the game. Even the most disruptive of digital business today, such as Uber and AirBnb, use traditional IT systems, IT support and BPO support to get things done. The key is to “ring-fence” the legacy so it can’t constrict the emerging technology from enabling the business. The goal of the OneOffice is to engineer processes to ensure that the whole of an organization is greater than the sum of its parts. Any system within any organization is likely to become inefficient or requires maintenance and overhaul at some point. Systems and processes with closed feedback loops are an issue with current business practices in many industries. Until recently, innovation has been typically driven by the experience of business leaders and has not had the benefit of the vast amount of data – particularly around the causes and effects of changes to business models and business practices. The biggest change driven by digital is not only the better interaction or access to new markets, but more the data that can be collected and analyzed from interactions. It gives companies instant (or near instant) feedback on its decision-making loops – which can be used to create a massive open feedback loop for decision making. In such a feedback loop, the impact of changes made in any part of the system can be tracked and analyzed. This data can determine, for example, when and how products are launched, the level of training a new product will require – and perhaps, more importantly, whether this strategy was correct. The open feedback loop is the heart of Design Thinking and the key to successful OneOffice schema. All parts of the organization are joined so cause and effect can be judged. Failure can be measured and learned from. The real reasons for success can be measured and replicated. 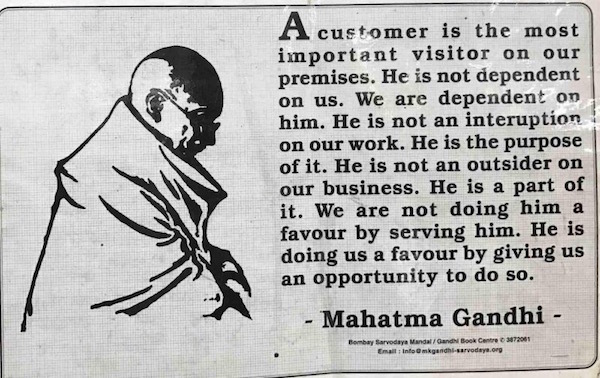 We've been talking about aligning support functions with the goals / mission of the firm for decades now, but digital is realigning us all with the true uberlord of the organization - the customer. If our supporting technologies and people can finally respond to, interpret, predict and be part of our digital customer experience, we'll finally see those barriers stagnating organizations come crashing down. I love the Digital Underbelly! What a great way to describe the inner workings of the digital organization. This is a great "endgame" for enterprises as you describe. My concern here is it's too idealistic for clients to work towards - what has your response been? It's all about allowing customers to do what they need without the meddling company in the middle. End to end experiences ad hoc created and driven dynamically by the customer. This is probabably the best "model thinking" yet from HFS. I love how you've used the human body to break out how a company works! Phil, yet another 'power-article'! Some great insights that many will find extremely useful. This is a very strong paradigm, Phil and a great "endgame". I would love to know how companies can get there!